The Nestle Boost Breeze Supplement Peach Liquid 8oz Brik Pak Case of 27, Model #18640000, is anchored in advanced science and research. Nestle Healthcare Nutrition offers nutritional solutions for people with specific dietary needs related to illness, disease states or the special challenges of different life stages. 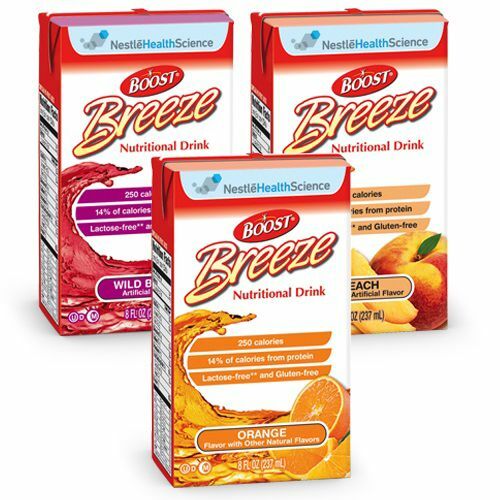 The Nestle Boost Breeze Supplement Peach Liquid 8oz Brik Pak Case of 27 is a convenient source of additional protein and calories in a fruit-flavored drink. One 8 fl oz serving of this fruit flavored, clear-liquid nutritional drink provides 250 calories and 9 grams of high quality protein.